Beautiful hair is particularly important for the body and self-image of every person. They therefore find light, so-called diffuse hair loss particularly bothersome, although it affects both genders equally. This product is a safe health supplement for hair growth. It enriches hair follicles with all required nutrients – in specially formulated quantities, to bring the best supplement to fulfill the nutritional needs of hair - and overall nutritional supplementation. This formula was specially created to assist with the nutritional needs of hair. This formulation is safe and is recommended for those people who are suffering from baldness or other problems related to hair. Amino acids, Vitamins with zinc is a hair growth supplements to promote hair growth. A diet rich in protein, vitamins and minerals is essential for healthy hair and hair growth. Hormonal changes: Hormonal changes associated with menopause can affect the healthy hair growth cycle. Stress: Everyday stress can affect the condition of their hair and it can turn into a vicious circle: stress affects the hair cycle and the impact of this can cause more stress for the individual. Poor diet: The hair follicle is a nonessential tissue and, therefore, one of the last tissues to receive nutritional substances. Therefore, any long-term deficiencies may lead to premature hair loss. Over styling: Excessive use of aerosol sprays, hair dyes, hair irons or curlers may result in damaged hair in the long term. Smoking: Smoking can affect healthy hair growth. Cigarette smoking has been shown to cause poor circulation, which can affect the amount of blood flow available to the hair follicles of the scalp. Vitamins have important roles in the synthesis of new tissue and maintenance and repair of damaged cells. PABA has been linked to hair growth as well as reversing the graying of hair loss. Amino acids like L-cysteine and L - Methionine are present in this combination which is essential to maintain hair growth. Zinc helps in promoting new and healthy skin cells, which aids in a healthy scalp which is responsible for hair luster and growth. This a synergistic combination of essential components which not only supports the structure and function of hairs but also improves the immunity of the individual promoting efficient and long lasting health. The appearance of hair plays an important role in people's overall physical appearance and self-perception. Taking L-cysteine for hair growth is a natural way to improve the health of your hair through nutrient intake.L-cysteine is one of few amino acidsfound in the body that has the ability to make what are called disulfide bonds.Such bonds are extremely important for giving hair its long, strong fibrous properties that hold in moisture, help maintain thickness and give each strand its shine. L-cysteine is one of the key components to building the all-important hair protein called keratin. Keratin is a long fibrous protein manufactured in skin cells, nail cells and hair cells. Without L-cysteine and keratin, the body could not make hair fibers in the appropriate cells. This amino acid is also vital for the synthesis of the precursor to collagen called procollagen and it is a major content of keratin. As antioxidant, methionine also helps to protect the hair follicles from oxidative stress, low concentrations of methionine cause a decline in hair health and growth diminishes. The sulphurous α-amino acid L-methionine is an essential amino acid. The main functions of L-methionine include the building of various protein molecules and the synthesis of the equally sulphurous amino acid L-cysteine. Methionine can therefore considerably strengthen the hair structure and nails. Methionine can also help against hair loss. This amino acid could also have an important role in slowing the greying of hair, as well as hair thinning. It is a good lipotropic as it helps in breaking down fat and prevents fat accumulation in arteries and specific body areas. This functionality of Methionine increases blood supply to the hair follicles and scalp. This further leads to hair growth. PABA is the short form for Para-AminoBenzoic Acid. PABA is a naturally-occurring, water-soluble compound and as a cofactor of the vitamin B complex (associated with folate). One very interesting application for this versatile substance is its potential to restore hair to its natural color and important for healthy skin. 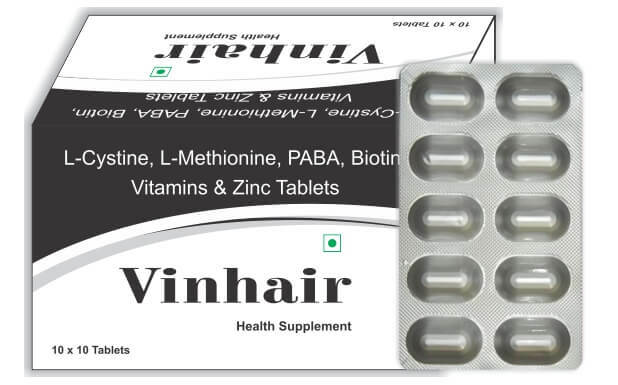 PABA is one of those vitamins that are like a utility used to grow hair. It is a great helper of other substance and nutrients in the body that can help grow your hair fast. PABA has also been linked to the reversing of grey hair, but only if the causes of the loss of the original hair color can be attributed to a shortage of PABA in the first place. PABA helps build protein, which is all that hair is as well as protect the hair from ultra – violet radiations and also helps the body build red blood cells which in turn carry nutrients to hair follicles and waste away so the hair can quickly grow fast and long. It is a form of vitamin B5, also known as Pantothenic Acid. Pantothenic Acid enhances the appearance and feel of hair, by increasing hair body, suppleness, or sheen, or by improving the texture of hair that has been damaged physically or by chemical treatment. Pantothenic acid is necessary for the preservation of the healthy complexion, beautiful hair and nails. The lack of calcium pantothenate has highly negative effects on the skin: the reduction of its elasticity, faster ageing process and progression of wrinkles; on the hair – the deterioration of its quality, loss of its shine and higher fragility. Pyridoxine is a part of the B group vitamins and is water-soluble and is required for both mental and physical health. Pyridoxine is required for the balancing of hormonal changes in women as well as assisting the immune system and, in the growth of new cells. It is also used in the processing and metabolism of proteins, fats and carbohydrates, while assisting with controlling your mood as well as your behavior. Pyridoxine might also be of benefit for children with learning difficulties, also it aids in the prevention of dandruff, eczema and psoriasis. Important for hair health and may help promote its growth. For energy and red blood cell production, vitamin B6, along with the other B-vitamins, also helps keep hair healthy. vitamin B6 is also important for skin health, which is necessary for good hair. One of the most commonly known vitamins to promote strong hair is biotin, a B-complex vitamin. Biotin promotes healthy hair by increasing the hair's elasticity and protects against dryness, which also helps prevent breakage. Biotin has been shown to promote hair growth, thicken the hair strand, and prevent hair loss. This B vitamin helps maintain healthynerves and is also one of those B vitamins that are essential for creating the amino acids that make up protein. As your hair is 100% protein it becomes necessary to have enough B12 or your hair could become dull, brittle, dry and unable to repair itself. vitamin B12 is part of the structure of the hair, so maintaining proper level of B12 will help to increase the overall health of the hair. Health experts agree that eating a well – balanced diet that contains the vitamins and minerals can help to maintain the health of the hair. Zinc is a trace element in the human body yet it is essential for a lot of biochemical processes. Some of the essential processes dependent on Zinc include cell reproduction, production and maintenance of hormone levels, protein synthesis and absorption of vitamins and other minerals. Zinc is a vital mineral for healthy hair, skin and nails. Zinc is also believed to play a crucial role in DNA and RNA production. This is required for the normal division of hair follicle cells, leading to healthier hair growth.Zinc also may help keep hormone levels balanced, which could be one of the reasons why it is so effective in preventing hair loss. There are even a few outlying studies in which people's grayed, aged hair returned to its original color when nourished with zinc. Zinc for hair growth may help eliminate dandruff on the scalp as well. It has a critical part to play in ensuring that our immune system is strong and healthy. Zinc helps in promoting new and healthy skin cells, which aids in a healthy scalp which is responsible for hair luster and growth. For those with skin and scalp conditions, zinc is used as an anti-inflammatory, which helps to sooth the skin tissue, especially those suffering from psoriasis or eczema on the scalp.